يوفر فندق فندق مانترا تيراس ظروف إقامة راقية وهو خيار رائج للسياح ولرجال الأعمال أيضاً. يقع في منطقة تسوق, مطاعم, سياحة من بريسبان. يقع مركز المدينة على بعد 1 km فقط. ويمكن الوصول إلى المطار خلال 20 دقيقة. بالنسبة لمن يريد الخروج، هذه بعض المعالم السياحية المتوفرة للزوار Jason Withers Original Diamonds, كنيسة مدينة تابرناكل المعمدانية, كنيسة سانت أندرو اللوثرية. استمتع بالخدمات الراقية والضيافة التي لا مثيل لها بهذا الفندق في بريسبان. يمكن الاستمتاع بمجموعة من الخدمات على أعلى المستويات في الفندق كمثل مكتب الاستقبال على مدار الساعة, مرافق مخصصة لذوي الاحتياجات الخاصة, تسجيل وصول/خروج سريع, تخزين الأمتعة, واي فاي في المناطق العامة. تنعكس أجواء فندق مانترا تيراس في غرف الضيوف.تلفزيون بشاشة مسطحة, قهوة فورية مجانية, شاي مجاني, بياضات, مناشف هي بعض الميزات الموجود في العديد من الغرف. كما أن مجموعة الخدمات الواسعة الموجودة في الفندق لضمان راحتك تترك لك الكثير من الخيارات لقضاء وقتك أثناء فترة إقامتك. يشكل فندق مانترا تيراس بخدماته الراقية وموقعه الممتاز، قاعدة مثالية للاستمتاع بإقامتك في بريسبان. يوجد مكان خارجي لانتظار السيارات برسم إضافي. تتوفر خدمة الواي فاي/الاتصال بالإنترنت في هذا العقار لقاء رسوم إضافية. Booked for 1 night only, the room was quite small and difficult to open up our luggages. The room is neat and tidy, the beds are comfortable. Overall stay was ok, had to checkout early in the morning the next day. 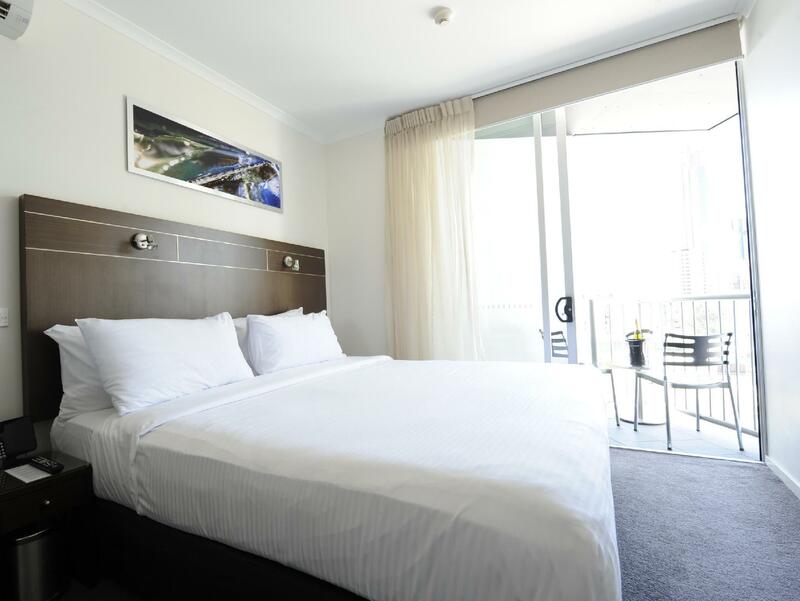 Mantra terrace delivers a super comfortable/clean, practicle base from which to explore the city and surrounds with its perfect location within walking distance to everything from the train station, Queen st mall, fortitude valley and the gorgeous botanic gardens to restaurants, the riverside etc. Add this to the friendly professional staff and you have the perfect place to stay for holidaymakers or business people alike! Would definitely recommend this hotle and will happily stay again when we next we visit beautiful Brisbane! Great location good customer service real nice friendly bar downstairs but just make sure you go threw what is in the mini bar whn you arrive as there were alot of items missing that we could have been charged for if i did not pick up on it. Overall satisfied, room fairly small, shower mouldy some parts, but nice front desk and hotel at 5mn on foot to the central station. Staff very nice- helpful & friendly. The location was perfect, it was a nice 10 min walk from hotel to Queen Street and cafe downstairs served decent breakfast and great service. However, the stay was not pleasant. I was informed by front desk at check-in that this booking by Agoda did not include cleaning fees (this was not stated on the website). If guests require room cleaning, it will be AUD25/day and fresh towels will be AUD15/time. Requested hotel to help facilitate this with Agoda but they insisted that this is what they are told and they can't do anything about it because I did not book it via their website. What do you do when nobody will clean your room? I disposed my daily trash in the public bins outside the hotels, so the room will not smell. Is this what is expected from a hotel? Definitely not. This is also the first time I am disappointed with Agoda for the slow delay in customer service, I called them on the first and second day after I checked in, but I only received a response from them on the last night I was there (I checked in for 5 nights) that did not resolve anything. FYI, I use Agoda for all my hotel bookings. Dear Jasmine, Thank you for sharing your feedback about your recent stay at Mantra Terrace Hotel. Please accept my sincere and heartfelt apologies for the obvious inconvenience caused during your stay. I have since shared your feedback with our Revenue Team to immediately investigate the deficiencies you mentioned. Thank you for highlighting this an I am sorry you were affected. I can confirm that after reviewing your reservation which came through Booking.com to us it did actually state that the room you had booked was an unserviced Eco rate booking which did not include daily room servicing and rather a weekly service however I appreciate that the confirmation you had received may have been through Agoda. As Agoda is recently become part of the Booking.com group this is where the confusion exists and we have now contacted our Market Managers to engage their expertise to rectify this identified content issue as I agree with you that there is some lacking content on Agoda. The hotel is very clean. Very clean bedsheet and bathroom. The room is small but it doesn't matter for solo traveller like me. One thing I don't like is the curtain. The light still can escape through the curtain. I wish it would be darker. But, I'm very happy with overall. Very quick to check in. The hotel room itself is clean and modern. The shower has a great rain-like shower head which is amazing. I feel like the lighting is too cool and dull. If they had some warmer and brighter lighting then the room would be 10/10! Everything was perfect as all we wanted to do was arrive , relax , have a quiet drink in the room , head out to dinner then a show . It's close to a couple of trendy cafes and bars and also to Central train station . The room was modern , great decor , spacious , bathroom clean and spacious , and had a bed which we wanted to take home ! Car parking was just over the road and cost us $22 . Perfect , no fuss getaway , just as we like it ! I stayed here for two nights. Enjoyed it very much. BUT I wasn't happy with the fact that I booked for a place thinking it was a self contained, only to be given a room that was designed for the handicap? I mean, I have nothing against the handicap. But that's quite misleading. The lady at the reception even added to the deception that my room was "exactly the same as all the other except your room has a bigger bathroom and is more accessible" I WONDER WHY. Besides that I enjoyed my stay, and the refreshing cold water at the front desk was my highlight. After a terribly hot day, it was nice to come home to a refreshing drink. I arrived the hotel in the late evening, just to rest a night and catch a train to Gold Coast in the next morning. I have no time to try their food, but the location just next to Centrel Railway Station..which is quite convenient to me..The bed is very nice for sleep, room is nice and clean with modern design..
We only stayed one night. Didn't have any food here so cannot comment. The room was quite small but that didn't bother me. Only thing that was annoying was the bathroom light over the mirror was not working so it was dark in there. 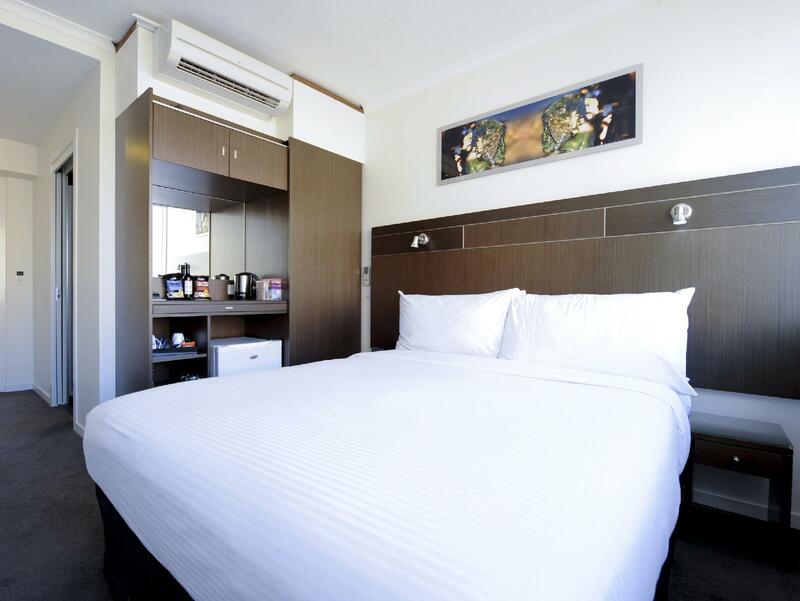 Hotel is in the city center, very near Central Station and Queen Street Mall. It is very convenience to go for business in city center or travel by bus, train , and ferry. The room is small about 16sq.m. but it is acceptable. I really like the beds , very comfortable and made me sleep well. The staffs are very friendly and helpful. I think I would go back to this hotel again and recommend to my friends. I liked my overall stay of 7 Days at Mantra Terrace Hotel. The train station and Queen Street shopping mall wasn't too far away. The area is quiet and a little hard to believe that it is near the city centre. I would comment that cleanliness is average, but the toilet brush & toilet brush container was very dirty. I believe I saw a wormlike figure in the container. Other than that, the housekeeping staff left me fresh towels and shampoo for each day that I did not ask for housekeeping. Mantra Terrace Hotel is a great place to stay for more than 4 days. The staff service was good, even staying open 24 hours on Christmas and New Year's. Air conditioner controller did not work - but I did not seek assistance. I have no doubt the staff would have immediately resolved it. The television menu was mostly in a foreign language. I was tolk at reception that I could get the restaurant menu on the television but it was impossible to know what was there or where to find it. This is a very stylish hotel. Our room was spacious. We loved the large bathroom. Parking is expensive and no ins and outs, but we found nearby street parking that was free all weekend. Area is dead evenings and weekends and can be hard to find food nearby. It's there, you just have to search. The room is small but cosy. Room is self sufficient with Wifi and a good choice of TV channels. Location is very close to the city. However the hotel is on top of a hill so the walk may be a little difficult for older people. Great staff, very friendly. Location. 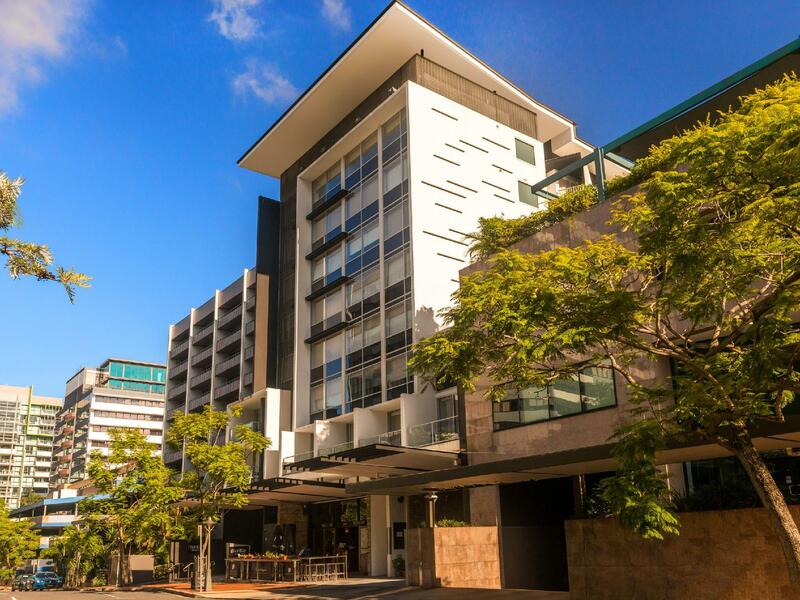 Really great location for Brisbane CBD. The lead in room category is tiny. There is no desk in the room to set up and work from a laptop and I resorted to using the ironing board to set up the laptop, sit on the edge of the bed and type some emails. A bit desperate really. It was also a room which had non-opening windows - another peeve of mine. The staff were great however, very welcoming. Car parking is pretty steep at $28 per day and the car park is over the road - which is a minor irritation. If I returned to Brisbane I'd probably stay elsewhere. Having said that, if all you're after is room for the night in a good location - give it a go, for sure.